We have a great selection of 2 and 3 berth caravans suitable for all tastes and budgets and available to view across our 3 branches. Two and three berth caravans make an ideal holiday home for both couples and young families and we offer flexible finance options and superb part exchange prices should you wish to upgrade. Either browse online or pop in store. Visit our branches in Wiltshire, Oxfordshire and Berkshire to view one of the largest ranges of used 4 berth caravans in the UK. Our four berth caravans are competitively priced to suit couples and families alike, whatever your budget! We offer honest advice and have some fantastic payment options available to enable you to find your perfect used 4 berth caravan. Our used 5 berth caravans suit smaller families or even those couples who prefer a little more room in their caravan. We have all the top makes and models available to suit all tastes across our 3 branches in Swindon, Oxford and Reading and we offer great part exchange deals and finance solutions. 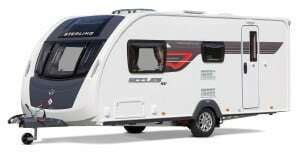 You’re sure to find your ideal five berth caravan. We offer free and honest advice on helping you find the right caravan for you. Our 6 berth caravans, either single or twin axle, are suitable for large families. Towing weights will often increase with the size of the caravan and we’ll make sure your tow car is suitable. Collect your new six berth family home today from one of our three branches.